This article is about the county in England. For other uses, see Cheshire (disambiguation). The county covers 905 square miles (2,344 km2) and has a population of around 1 million. It is mostly rural, with a number of small towns and villages supporting the agricultural and other industries which produce Cheshire cheese, salt, chemicals and silk. Cheshire's name was originally derived from an early name for Chester, and was first recorded as Legeceasterscir in the Anglo-Saxon Chronicle, meaning "the shire of the city of legions". Although the name first appears in 980, it is thought that the county was created by Edward the Elder around 920. 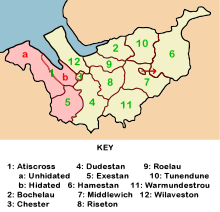 In the Domesday Book, Chester was recorded as having the name Cestrescir (Chestershire), derived from the name for Chester at the time. A series of changes that occurred as English itself changed, together with some simplifications and elision, resulted in the name Cheshire, as it occurs today. After the Norman conquest of 1066 by William I, dissent and resistance continued for many years after the invasion. In 1069 local resistance in Cheshire was finally put down using draconian measures as part of the Harrying of the North. The ferocity of the campaign against the English populace was enough to end all future resistance. Examples were made of major landowners such as Earl Edwin of Mercia, their properties confiscated and redistributed amongst Norman barons. William I made Cheshire a county palatine and gave Gerbod the Fleming the new title of Earl of Chester. When Gerbod returned to Normandy in about 1070, the king used his absence to declare the earldom forfeit and gave the title to Hugh d'Avranches (nicknamed Hugh Lupus, or "wolf"). Because of Cheshire's strategic location on Welsh Marches, the Earl had complete autonomous powers to rule on behalf of the king in the county palatine. The earldom was sufficiently independent from the kingdom of England that the 13th-century Magna Carta did not apply to the shire of Chester, so the earl wrote up his own Chester Charter at the petition of his barons. Hundreds of Cheshire in Domesday Book. 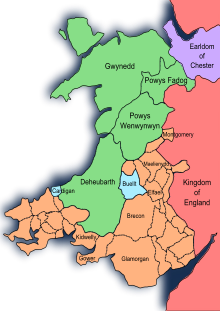 Areas highlighted in pink became part of Flintshire in Wales. Prehistoric burial grounds have been discovered at The Bridestones near Congleton (Neolithic) and Robin Hood's Tump near Alpraham (Bronze Age). The remains of Iron Age hill forts are found on sandstone ridges at several locations in Cheshire. Examples include Maiden Castle on Bickerton Hill, Helsby Hillfort and Woodhouse Hillfort at Frodsham. The Roman fortress and walls of Chester, perhaps the earliest building works in Cheshire remaining above ground, are constructed from purple-grey sandstone. Early brick buildings include Peover Hall near Macclesfield (1585), Tattenhall Hall (pre-1622), and the Pied Bull Hotel in Chester (17th-century). From the 18th century, orange, red or brown brick became the predominant building material used in Cheshire, although earlier buildings are often faced or dressed with stone. Examples from the Victorian period onwards often employ distinctive brick detailing, such as brick patterning and ornate chimney stacks and gables. Notable examples include Arley Hall near Northwich, Willington Hall near Chester (both by Nantwich architect George Latham) and Overleigh Lodge, Chester. From the Victorian era, brick buildings often incorporate timberwork in a mock Tudor style, and this hybrid style has been used in some modern residential developments in the county. Industrial buildings, such as the Macclesfield silk mills (for example, Waters Green New Mill), are also usually in brick. Cheshire covers a boulder clay plain separating the hills of North Wales and the Peak District (the area is also known as the Cheshire Gap). This was formed following the retreat of ice age glaciers which left the area dotted with kettle holes, locally referred to as meres. The bedrock of this region is almost entirely Triassic sandstone, outcrops of which have long been quarried, notably at Runcorn, providing the distinctive red stone for Liverpool Cathedral and Chester Cathedral. The Cheshire Plain from the Mid-Cheshire Ridge. Cheshire contains portions of two green belt areas surrounding the large conurbations of Merseyside and Greater Manchester (North Cheshire Green Belt, part of the North West Green Belt) and Stoke-on-Trent (South Cheshire Green Belt, part of the Stoke-on-Trent Green Belt), these were first drawn up from the 1950s. 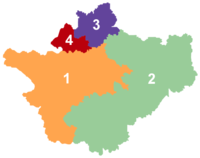 Contained primarily within Cheshire East and Chester West & Chester, with small portions along the borders of the Halton and Warrington districts, towns and cities such as Chester, Macclesfield, Alsager, Congleton, Northwich, Ellesmere Port, Knutsford, Warrington, Poynton, Disley, Neston, Wilmslow, Runcorn, and Widnes are either surrounded wholly, partially enveloped by, or on the fringes of the belts. The North Cheshire Green Belt is contiguous with the Peak District Park boundary inside Cheshire. In 2001, the population density of Cheshire was 32 people per km2, lower than the North West average of 42 people/km2 and the England and Wales average of 38 people/km2. Ellesmere Port and Neston had a greater urban density than the rest of the county with 92 people/km2. Policing and fire and rescue services are still provided across the county as a whole. The Cheshire Fire Authority consist of members of the four councils, while governance of Cheshire Constabulary is performed by the elected Cheshire Police and Crime Commissioner. Winsford is a major administrative hub for Cheshire with the Police and Fire & Rescue Headquarters based in the town as well as a majority of Cheshire West and Chester Council. It was also home to the former Vale Royal Borough Council and Cheshire County Council. A mainly rural county, Cheshire has a high concentration of villages. Agriculture is generally based on the dairy trade, and cattle are the predominant livestock. Land use given to agriculture has fluctuated somewhat, and in 2005 totalled 1558 km2 over 4,609 holdings. Based on holdings by EC farm type in 2005, 8.51 km2 was allocated to dairy farming, with another 11.78 km2 allocated to cattle and sheep. Cheshire is considered to be an affluent county. However, towns such as Crewe and Winsford have significant deprivation. The county's proximity to the cities of Manchester and Liverpool means counter urbanisation is common. 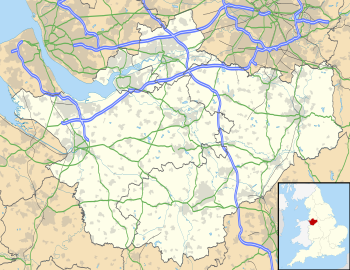 Cheshire West has a fairly large proportion of residents who work in Liverpool and Manchester, while the town of Northwich and area of Cheshire East falls more within Manchester's sphere of influence. Cheshire has two Football League teams, Crewe Alexandra and Macclesfield Town, who both play in League Two. Chester, a phoenix club formed in 2010 after ex-Football League club Chester City was dissolved, competes in the National League North. Northwich Victoria, another ex-League team who were founder members of the Football League Division Two in 1892/1893, now represent Cheshire in the Northern Premier League along with Nantwich Town, Warrington Town and Witton Albion. 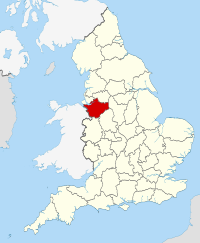 Notable places in Cheshire – red. Towns historically in Cheshire – orange. 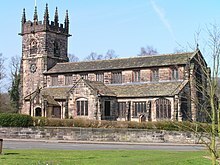 Parts of Cheshire away from the affluent areas, such as those around Blacon, Crewe, Ellesmere Port and Winsford, are among the top 5% most deprived areas in Northern England; the price of an average 4-bedroom detached house in Knutsford is around £470,000 compared to £220,000 in Winsford and Ellesmere Port. Bus transport in Cheshire is provided by various operators. The major bus operator in the Cheshire area is Arriva North West. Other operators in Cheshire include Stagecoach Chester & Wirral, Halton Transport and Network Warrington. There are also several operators based outside of Cheshire who either run services wholly within the area or services which start from outside the area. Companies include Arriva Buses Wales, BakerBus, High Peak, First Greater Manchester, D&G bus and Stagecoach Manchester. Some services are run under contract to Cheshire West and Chester, Cheshire East, Borough of Halton and Warrington Councils. Crewe (the biggest station in Cheshire) for trains to London Euston and Scotland (via the WCML), Wales, The Midlands (Birmingham, Stoke and Derby) as well as suburban services to Manchester Piccadilly, Chester and Liverpool Lime Street. ^ "Cheshire 2019/2020". High Sheriff of Cheshire website. ^ "Cheshire". Random House Webster's Unabridged Dictionary. ^ "Relationships / unit history of Cheshire". A Vision of Britain through Time website. Retrieved 5 March 2007. ^ "Cheshire County Council". Cheshire County Council website. Archived from the original on 27 February 2007. Retrieved 5 March 2007. ^ "Cheshire County Council Map" (PDF). Cheshire County Council. Archived from the original (PDF) on 5 June 2007. Retrieved 5 March 2007. 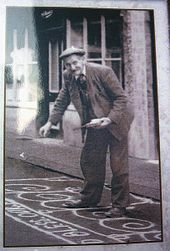 ^ "Towns & Villages in Cheshire - Visitcheshire.com". www.visitcheshire.com. Retrieved 29 May 2017. ^ "Wrexham County Borough Council: The Princes and the Marcher Lords". Wrexham.gov.uk. Retrieved 14 May 2014. ^ Hewitt, Herbert James (1929). Mediaeval Cheshire: An Economic and Social History of Cheshire in the Reigns of the Three Edwards. Manchester: Manchester University Press. p. 9. Certainly there were links between Cheshire and south Lancashire before 1000, when Wulfric Spot held lands in both territories. Wulfric's estates remained grouped together after his death when they were left to his brother Aelfhelm, and indeed there still seems to have been some kind of connexion in 1086, when south Lancashire was surveyed together with Cheshire by the Domesday commissioners. Nevertheless, the two territories do seem to have been distinguished from one another in some way and it is not certain that the shire-moot and the reeves referred to in the south Lancashire section of Domesday were the Cheshire ones. ^ "Cheshire ancient divisions". Vision of Britain website. Retrieved 6 March 2007. ^ Jones, B.; et al. (2004). Politics UK. ^ a b "The Cheshire (Boroughs of Halton and Warrington) (Structural Change) Order 1996". Office of Public Sector Information. Retrieved 6 March 2007. ^ "Cheshire County Council: Revealing Cheshire's Past". .cheshire.gov.uk. 1 September 2004. Archived from the original on 17 November 2004. Retrieved 25 September 2010. ^ "Images of England". Images of England. Retrieved 25 September 2010. ^ Historic England. "Details from listed building database (1261746)". National Heritage List for England. Retrieved 22 January 2013. ^ Historic England. "Details from image database (55781)". Images of England. Retrieved 25 September 2010. ^ "Walking Cheshire's Sandstone Trail". Archived from the original on 22 July 2011. ^ "Cheshire East Council Green Belt Assessment Update 2015 - Final Consolidated Report". Cheshire East Council. ^ "Local Plan - Green Belt Study Part One". Cheshire West and Chester Council. ^ "Widnes and Hale Green Belt Study" (PDF). www3.halton.gov.uk. Halton Council. ^ "Warrington Borough Council Green Belt Assessment Final Report Final - 21 October 2016" (PDF). www.warrington.gov.uk. Warrington Council. ^ a b "Census 2001 – Population" (PDF). Cheshire Census Consortium. Archived from the original (PDF) on 5 June 2007. Retrieved 6 March 2007. ^ "CCC Long Term Population Forecasts" (PDF). Cheshire County Council. Archived from the original (PDF) on 5 June 2007. Retrieved 6 March 2007. ^ A Vision of Britain through Time. "Cheshire Modern (post 1974) County: Total Population". Retrieved 10 January 2010. ^ a b "Key Statistics Interim Profile" (PDF). Cheshire County Council. Archived from the original (PDF) on 5 June 2007. Retrieved 6 March 2007. ^ "The Lord Lieutenant of Cheshire". Cheshire County Council. Archived from the original on 3 February 2007. Retrieved 6 March 2007. ^ "Cheshire (Structural Changes) Order 2008". Opsi.gov.uk. Retrieved 25 September 2010. ^ "BBC News, 25 July 2007 – County split into two authorities". BBC News. 25 July 2007. Retrieved 25 September 2010. ^ "The Cheshire (Structural Changes) Order 2008". Office of Public Sector Information. Archived from the original on 23 December 2008. Retrieved 25 February 2009. ^ "Unitary legal fight over in 60 seconds". LocalGov.co.uk. Archived from the original on 22 July 2011. Retrieved 25 February 2009. ^ "Local Authorities". Government Offices of the North West. Archived from the original on 26 September 2007. Retrieved 6 March 2007. ^ Chester Diocese (Church of England). Archived 31 December 2008 at the Wayback Machine Official website. Retrieval Date: 30 September 2007. ^ Diocese of Shrewsbury (Roman Catholic). Archived 29 July 2010 at the Wayback Machine Official website. Retrieval Date: 30 September 2007. ^ "Agricultural Holdings – Land and Employment – Cheshire – 2002 to 2005" (PDF). Cheshire County Council. Archived from the original (PDF) on 5 June 2007. Retrieved 3 June 2007. ^ a b c "Cheshire Economy (page 64)" (PDF). Cheshire County Council. Archived from the original (PDF) on 16 June 2007. Retrieved 6 March 2007. ^ "Top Ten Most Affluent Villages in the UK". The Telegraph. 17 February 2017. Retrieved 24 February 2017. ^ "Chester Named Top Place to Live in UK". The Chester Chronicle. 21 September 2015. Retrieved 24 February 2017. ^ "Area Profile" (PDF). Cheshire East Council. Cheshire East Council. Retrieved 11 September 2017. ^ "The Thundersprint". Archived from the original on 14 November 2011. Retrieved 12 May 2011. ^ Robinson, Julian; Crossley, Lucy (2 February 2015). "Terror for Man United's Angel di Maria as thugs try to break into his mansion - Daily Mail Online". Daily Mail. Retrieved 2 February 2015. ^ John Mayall biographical details. Archived 26 December 2011 at the Wayback Machine www.johnmayall.com website. Retrieval Date: 21 February 2008. ^ Bono, Salvatore. "Speaking With Your New Favorite Band -- The 1975". Huffington Post. Retrieved 5 May 2015. ^ "BBC Radio Cheshire - Radio - Digital Spy Forums". Forums.digitalspy.co.uk. Retrieved 14 May 2014. ^ "BBC News - Stoke & Staffordshire". Bbc.co.uk. Retrieved 14 May 2014. ^ "About The Royal Cheshire County Show | The Royal Cheshire County Show". The Royal Cheshire County Show 2016. Retrieved 29 May 2017. ^ "Things to do - Plantlife in your area - North-west England". Plantlife. Archived from the original on 1 May 2013. Retrieved 11 July 2012. ^ "Why Cheshire fat cats smile". The Times. London. Retrieved 6 March 2006. ^ "Cheshire ancient county boundaries". Vision of Britain website. Archived from the original on 6 May 2007. Retrieved 6 March 2007. ^ "Cheshire 1974 boundaries". Vision of Britain website. Archived from the original on 6 May 2007. Retrieved 6 March 2007. ^ "Road policing". Cheshire Police website. Archived from the original on 5 November 2008. Retrieved 14 June 2009. Shores, Christopher; Franks, Norman; Guest, Russell (1990). Above the Trenches: A Complete Record of the Fighter Aces and Units of the British Empire Air Forces 1915–1920. Grub Street. ISBN 0-948817-19-4, ISBN 978-0-948817-19-9. Starkey, H. F. (1990). "Old Runcorn". Halton Borough Council.